for years and imagined what you could do with that kind of firepower. Nothing will stand in your way now. a 12-team mixed league, the most popular of leagues. Let’s take a look at what B-Rank says. Here’s a screen shot of the projections right around the dreaded turn. Click the image for a full-size look. The first thing that jumps out at you is that you may not want to take B-Rank’s #24 at the end of your second round. Of course, a team with both Albert Pujols and Adrian Gonzalez would hit a lot of home runs, but who would play the other positions on the diamond? Why fill up your utility slot that early? Now on to your second pick. There is no consensus #25. Zack Greinke, B-Rank’s suggestion, is a fine choice as he could be the best pitcher in baseball next year. But say you don’t want to pick a pitcher that early, what’s there for you? Consider Justin Upton, the proud owner of a new six-year $50+ million contract. Take a look at his OPS over the year last year, from Bloomberg Sports’ Fantasy Draft Kit. He stumbled early, but he was excellent all year and did not hit any sort of rookie wall. Add to this the fact that he cut his strikeout rate to an acceptable level (for a power hitter). After whiffing at a 34% rate his rookie year, he got that rate down to 26% by making more contact in the strike zone (80% last year, after 74% the year before). He also boosted his isolated power (ISO) from .213 to .232 while stroking those 26 home runs. The combination of Pujols and Upton would give you immense power with almost 30 combined steals to boot. Again though, unless Tulowitzki falls into your lap, you’ve done nothing about the scarcer positions on the infield. Taking a look at average draft positions from MockDraftCentral.com, we can identify some other candidates for The Turn. A couple interesting names emerge – Justin Upton is there (25.19 ADP), and so is Jimmy Rollins. 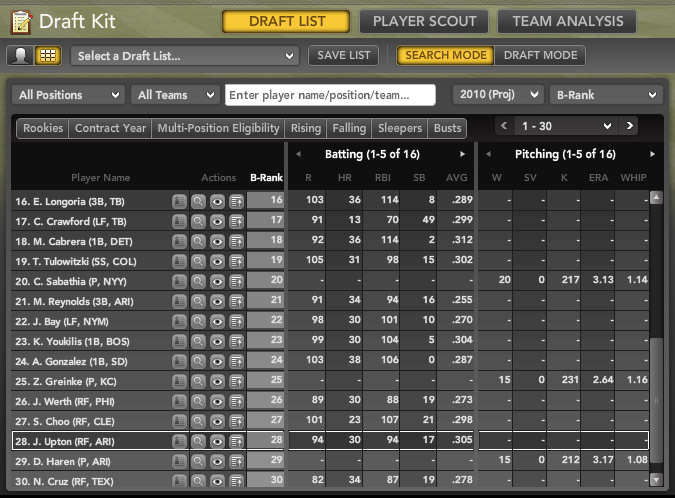 For more information on possible second- and third-round picks, and more, check out Bloomberg Sports’ fantasy kits.